MR Online | Lula’s witch trial: who are the TRF4? Crucial to this story is that the conservative bloc which now occupies Temer’s post-coup cabinet (and has since implemented a brutal neoliberal programme without the will of the people) includes 4 times defeated PSDB and heirs to ARENA Government of the 65-85 Dictatorship, now living on as “Democratas”, who have failed between them to win a Presidential election since 1998. These are, naturally, the political forces most involved, and most most vocal in their support of the case against Lula and the war on his PT (Workers Party) as a whole. The Brazilian right and their international supporters, although trying to rush through unpopular reforms and privatisationsbefore Temer must leave office, know that they cannot realistically expect to win an election in which the still wildly popular Lula is a candidate, despite decades of intensifying media vilification. There are two things that strike me. One is that none of the 3 TRF4 judges are specialists in criminal law, they are in health, commercial and civil law. The other thing that frightens me is that Gebran, the leader of the Tribunal, is a personal friend of Moro. They went to university together and afterwards both worked in the same court in Western Parana state. And this is unusual in that the first Lava Jato conviction ever occurred in that court. In 2013, there was a motion for clarification filed there which represents the first time a Lava Jato case rose to the district court level. In Brazil, this process is done through lottery and their court was the one which was this case was awarded to. 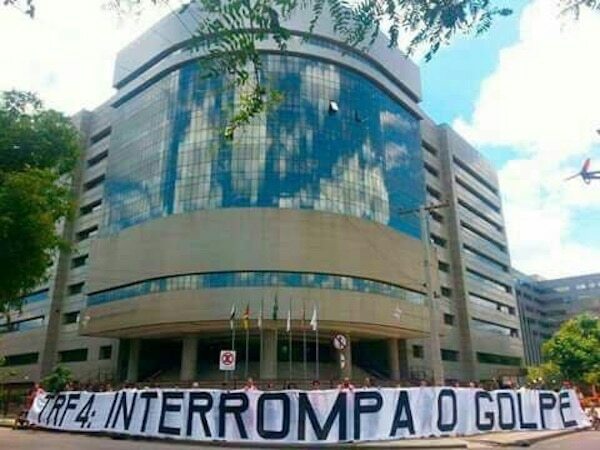 And from that point, all the Lava Jato resources passed through the same court with the same prosecutor/judge. So, their court was awarded the first Lava Jato case in 2013. In 2014 both of them were transferred. They opened two judge positions in the court, where they knew the Lava Jato case would continue. Gebran, Moro’s personal friend, was transferred into a court where they knew Lava Jato was going to continue. In other words, they chose who would decide on Lava Jato in advance. The court is composed of various groups of three prosecutors. Each one has a president, but the Court (TRF4) itself also has a president who can step in and make a judgement in case of a split decision. If the ruling against Lula is 2 – 1 the court president can step in. If Lula receives one vote in his favor there is a legal maneuver called an implementation motion in which judgement advances to a decision of the entire court, which if I am not mistaken is made up of 9 prosecutor/judges. But it is the court president (Carlos Eduardo Thompson Flores Lenz) who would coordinate that.